How do I Purchase from ELSA Support? ELSA support sells downloadable resources and you can purchase resources by Paypal, debit or credit card. Both options are displayed when you go through to checkout. You DO NOT need a Paypal account to purchase. 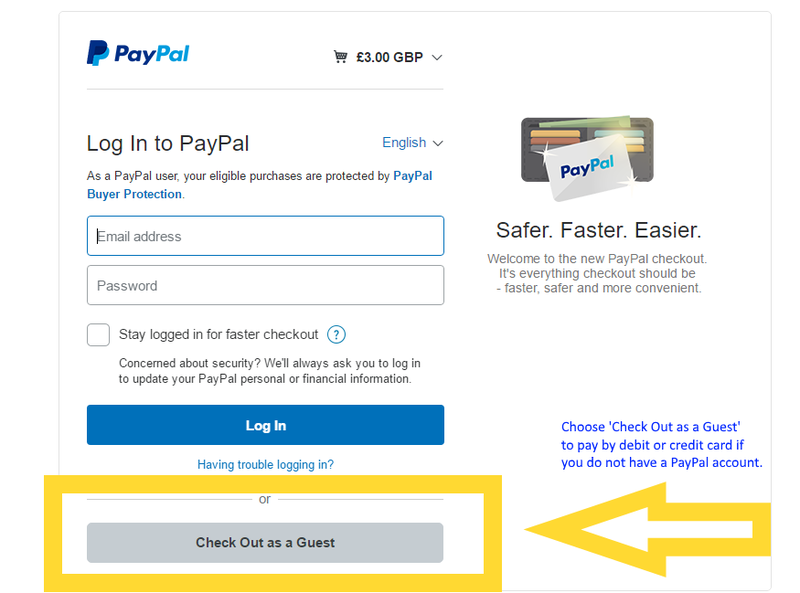 Choose ‘Checkout as a Guest’ when you go through to the Paypal screen. The vast majority of files are sold in zipped format which most computers and laptops will open automatically. If your computer is very old then you may need to download an unzipper which can be found online and downloaded for free. You can read a bit about zipped files here. Zipped files will not open on a phone or Ipad. ELSA Support is not responsible if you cannot open your files so please check you have unzipper software and an up to date Adobe Acrobat PDF reader on your computer. To go back to where you were click the ‘go back’ button which is at the bottom of the page. You will be asked to sign into the website with your username and password or you will be asked to create an account. The account is simply a way of you accessing your purchased resources should the email with links not reach you due to spam restrictions on your email account. You must tick the box that asks you to agree to the terms and conditions. At the bottom of the page is a blue button ‘Complete purchase’, click this. If you have a Paypal account enter your email address. Follow instructions by adding card details. After your purchase you will receive an email with clickable links from ELSA support. (Please check your spam folder if you do not receive this email). When you click these links your resources will download. Save them to your computer. It is advisable to download them immediately after receiving the email. They have a limited life span and if you try and download them months afterwards they will not work. You can also download your resources from your purchase history by logging onto the site with your username and password. Go to your account and then your purchase history. You can download them from there. Your purchase history is NOT guaranteed forever so it is important you save your resources to your computer. It is advisable that you use your email address as your username so that it is easily remembered. Unfortunately ELSA support does not have any control over your email accounts so if you do not receive the email then it is likely to be in your spam folder or your school’s internet security has rejected it. Schools may order by purchase order by filling in the School Order May 2018 and sending it by email to info@elsa-support.co.uk. There is a minimum order of £20 for this service. If you do not have a purchase order and want to pay by cheque, a proforma invoice can be raised where you pay for the items before receiving the downloadable links. Just contact ELSA Support if you want this option. There is a £10 minimum order for this service. Links to your resources will be sent by email and you will then be invoiced for the total amount. Payment must be made by cheque or BACS. We do not accept credit cards on purchase orders. Thank you for purchasing resources from ELSA Support! Contact me on info@elsa-support.co.uk should you need any further help.